I got involved in a forum thread in an online gaming community called "Games Beaten 2010." It encouraged members to begin listing the games they finished over the course of the year. I believe that my success in moving through a big chunk of my own collection in the past four and a half years (something I'd never dreamed would be possible beforehand) is something anyone can replicate, and I want to pass on nine tips I came to learn in the process to help others do so. Find a friendly online community interested in beating games together. The role of public discussion around the list of games you beat can be vital to your motivation for moving through to the credits. Gamers who share an interest in tackling their backlog love to tell each other what they think of one another's accumulating lists. Once I'd finish one of the games on my list, the idea of then getting to talk about it afterwards with a community of interested participants was exciting. That conversation was far more of an incentive to get to the credits than any ending cinematic, trophies, or achievements were. Many online gaming communities have threads like the one I participated in. Sites such as The Backloggery or Playfire are dedicated to enabling this kind of discussion, and are places where you may find a home. There are even some communities that form discussions around specific games that they play together, too, like Kotaku's own current Summer of Old JRPGs. It&apos;s time we try something different, folks. Something old. In my experience, the positive reinforcement from a community when you finish a game does much more to encourage you to check a game off your list than the act of simply moving it to another category in a database, another section of your shelf, or another column on a spreadsheet. Most importantly, I recommend that other gamers find a community that sees beating games as a basis for having friendly discussion about each game's merits, not as a competition to see who can rack up the biggest list. Though that might be a counterproductive atmosphere to some who seek motivation through competition, it was a great context for me to actually feel like I was making progress. Get in the habit of tracking your games. At the very least, you should begin by listing the games you've beaten this year. Past that, it may also be helpful to make a list of all the games you own (perhaps on a site like RF Generation) so that you can plan ahead. Which games do you want to prioritize? Which systems have you been ignoring? Which series do you have a lot games for? Eventually you can use game-tracking to keep a count of the number of games that you acquire, the number of games you beat year to year or month to month, the number of older vs. newer games you are playing, the number of games you are actively playing at once, etc. The idea here is to get data over time so that you can more strategically plan your game choices and your game time. If you find that, like me, you typically don't have a lot of free time in March, you may not want to start that 40-hour RPG at the end of February. If you notice that you rarely play any N64 games, you may temporarily stop picking up games for that system until it actually piques your interest again. Alternatively, if you have eight Dragon Warrior games and have never played any of them, maybe you want to finally give them a crack. Lists and stats are your friend. Don't fear them! Learn to use HowLongToBeat.com and plan your time carefully. This site didn't exist the first few years I was making my annual list, but it has since become a godsend. Part of planning to beat X number of games a year involves staggering your list with long games and short games in a way that fits your schedule. It can be immensely frustrating trying to play 2-3 games at once that each last 30 hours or more. If you want to play multiple games at a time, try to balance them out and play at least one short one and one long one simultaneously. If you know, for example, that you have two hours free on two nights this upcoming week, try to pick a game to beat that sits at around the 4-5 hour mark so you can get through it in your planned available time. Do this over the course of the month, and you might find that you easily beat 1-2 of the longer games while also polishing off a half dozen shorter titles from your backlog. Figure out how to use this resource in an effective way for you. Most importantly, don't dramatically change your current habits for allocating gaming time; one of the quickest ways to burn out of a serious attempt at tackling the backlog is to start piling a lot more hours of game time into your week than you currently afford. Game smarter and more carefully, not harder and longer. Allow yourself to occasionally play games without the intent of finishing them. Not every game in your backlog can or has to be beaten. Some genres might prove tough to focus on as part of your regular efforts to clear a backlog. Take time here and there to get in some time with a shmup that you have no realistic hope of beating, to play a few rounds of that obscure Genesis football title, etc. Part of tackling your backlog involves having first-hand familiarity with the games you own — and that doesn't always have to mean beating them. For example, I haven't "beaten" Truxton on Sega Genesis, but I have spent enough time with it to consider it one of my favorite shmups and I wouldn't consider it as being part of my backlog any longer. Embrace the accessibility of digital, mobile and portable games. One way to ensure that you can plow through games in your backlog is to make the games you are playing accessible to you across multiple formats. It might be hard to find an hour every night to hook up your PlayStation 2 to tackle the original Sly Cooper trilogy, but you might have an hour break at work every day where you could play the remade Sly Cooper Collection found on the Vita. Or maybe you want to play the original Mega Man games on the eShop. Maybe you're having a hard time screwing around with your PC to get an old DOS game going, but can opt for the ported iOS option instead. If the "most authentic original experience possible" is really important to you, it will likely end up hampering your efforts at beating your backlog. Determine for yourself what counts as "beating" a game. The most traditional definition for completing a game is probably reaching some kind of ending after which credits will roll. Some people argue that a game isn't "beaten" unless you finish it at 100% without dying while playing on the hardest difficulty. These opinions for "beating" a game vary by game, by genre, and by person, and that debate can certainly be part of the fun of playing through your backlog. But you're not in competition with others. Tackling your backlog is about challenging yourself. It is ultimately up to you whether or not to decide if you've "legitimately" beaten a game. Make judgments that you feel you can defend to yourself and feel satisfied with. That said, sites like The Backloggery list various categories of game completion, some of which may be helpful for you if you are on the fence on deciding if you can put a game on your big board. I typically count a game as beaten once the credits roll, but I almost always require myself to play on default or harder settings for games that have adjustable difficulty. In arcade games like fighters and shmups, I generally shoot for a 1cc or 4cc, depending on how fair I perceive the game to be. To count a sports game as beaten, I aim to complete a season and/or a playoff run as a league champion. I strictly avoid any kinds of cheats or hacks. Again, those rules are specific to me based on what I found to provide the right balance of challenge versus accomplishment, but everyone's own criteria will likely be different. Don't spend much gaming time playing things you've already beaten. Don't spend your time trying to 100% everything if you've already completed the main questline. Don't worry about reading every last line of dialogue and uncovering every last secret by working on multiple playthroughs. These activities are fine and fun if you aren't on a quest to get through a hefty backlog, but they can be kryptonite to any serious attempt. Certainly you can enjoy games to their fullest and try to get the most out of them. I personally prefer to start up a new game when I've hit the campaign credits and will only dip back into games like Borderlands 2 or Dragon Age with 20 hours or more of post-game content in little bits and pieces as I find time (including when a significant new piece of DLC comes along). A big problem for me early on was splitting my play time across five or six games at once, picking games to play randomly, or otherwise playing with no real goals in mind. Over time, as I decided to get serious about beating my backlog, I found ways to provide interesting challenges to myself in each yearly thread. One year, I wanted to beat at least one game for every system I owned. Another year, I decided to play through a few series in their entirety. I've made it a point to occasionally focus on runs of certain genres or systems. I've occasionally made it a goal to hit a certain number of games by a certain date (e.g. fifty by mid-July). These extra motivators also helped to give me a sense of my own gaming habits, providing an idea of which times of the year worked best to play certain kinds of games based on my schedule, which kinds of games I was neglecting, and which kinds of games I might want to pick up for future play. Remember that beating your backlog is a long-term goal. Beating a huge backlog is, in most cases, more of a mental block than a physical limitation. No, most of you will not get through your backlog in 1-2 years. But in 10-20 years? You could make some very serious dents in it. It would be easier still if you only wanted to reasonably experience but not necessarily beat every game. The size and scope of backlogs vary. Some gamers only want to include "current gen" games in their backlogs. Some who haven't adopted the latest generation of systems will only include games for systems they already own. 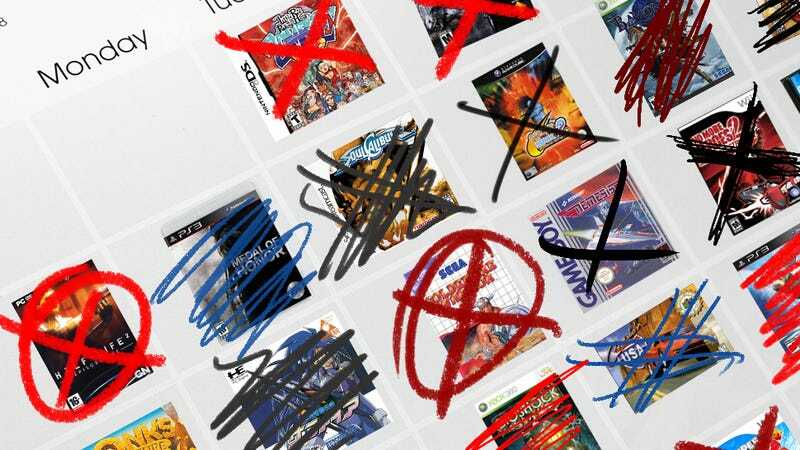 Many gamers have a backlog that encompasses selected titles across 30-40 years of gaming's history. But no matter how far back your backlog goes or what it entails — and even though games come out at an increasingly faster rate today — it certainly isn't unreasonable to think that you could focus much of your attention on the present while also playing a respectable number of older games every year. In the end you likely won't ever finish every game in your backlog, but you should get to a point where you've made a substantive dent in it and have the satisfaction of knocking out a lot of classic games, too. I've included with this post a list of the 400 games I've beaten over the past four and a half years (as of mid-June 2014). The number of games isn't ultimately very important – people will have differing amounts of free time or playing skills that will make this list an unhelpful comparison, and it isn't intended to be used that way. Instead, I've pasted the list primarily to give a sense of how I have personally approached attacking my backlog. You'll notice plenty of shorter arcade style games (shmups and fighters, for example), but I also think that there's a fair number of RPGs or longer action/adventure games in the final balance. There are more games for newer systems than older systems, but there's clearly a lot of retro stuff on the list as well. There are a few repeats of games I couldn't resist revisiting in a different year (and a couple that are meatier add-ons for games), but these are minimal. These nine tips are the general strategy that I plan to continue to use and that I hope will get me close to clearing around half of my backlog — which sits at around a couple of thousand games — in the next decade or so. If you've got other ideas and strategies you've used, be sure to sound off with your own tips or questions in the comments below! David Heineman is a professor who writes and teaches about rhetoric and new media, including video games. He can be reached via Twitter @DrHeineman.